A corporate team building day with a difference! During our team building cardio sessions, you will be working as a team, individually and also have that friendly competition against each other to create an environment packed with fun. 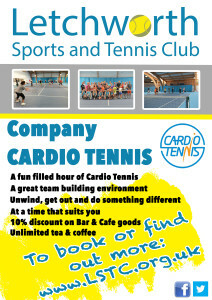 Cardio Tennis is for everyone and is a fun, sociable fitness class all to music! No tennis experience needed. All prices are based on the number of people attending and whether you will be adding lunch to your booking, so please do not hesitate to ask for a quote. Contact Charlotte at community@LSTC.org.uk or 01462 675444.